The term engagement has been thrown around a lot in the business world as of late. It is said that employee engagement is good for the organization. For employees to be engaged, there has to be a benefit to them as well. Employee engagement can be described as the level of commitment an employee has to an organization. It is the emotional commitment to the organization’s mission and goals. It has to do with how motivated they are to contribute to the vision of the organization. All the while, they must have a sense that by being committed to the organization, it will benefit them as well. If you are a for-profit business, then the ultimate indicator of success is your bottom line. If you are a church, then your bottom line is people. However, you need people to accomplish that goal. Most organizations do not realize this. Are you ready? 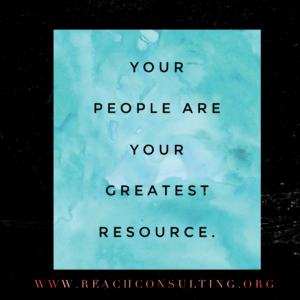 Your people are your greatest resource. If your employees feel a high commitment to the organization, they will want to learn new skill sets that will take them, and your organization, to the next level. Committed employees will spend less time messing around in their day and will have a higher productivity rate. They will be more focused on the tasks at hand. Engaged employees are also less likely to call in sick. Engaged, committed employees will stick around. It takes a significant amount of money to train new employees. Creating a high level of employee engagement ensures that your employee turn around is low. Engaged employees are satisfied with their jobs. They feel as though they are making a difference through their role in the company. Ultimately, job satisfaction usually means a happy, productive employee. When I am satisfied in my job, I am usually less stressed and healthier. Engaged employees feel like they have a stake in the company. They are given the tools and are empowered to accomplish the tasks set before them. A feeling of empowerment often leads to feelings of being esteemed. Which is one of our needs as people. Organizations that understand the value of their employees provide teaching and training. There is a level of personal development that the employee benefits from in these organizations. These skills can be technical, directly related to their job, or can be described as the soft skills in business. Employee engagement is relatively new but is a powerful tool in creating a healthy church. It is not about creating happy employees. However, happy employees tend to be at work on time and productive, which helps the bottom line of the organization. In your organization, are you engaged? As a supervisor, how can you create employee engagement?